Urban Yarns is pleased to announce and super stoked to host a book signing and trunk show for Alexis Winslow’s new book “Graphic Knits”. These events are few and far between so we get very excited when we have the opportunity to have an out of town “knit-designista” come to our shop, this is an event you won’t want to miss!!! But if not here is a little background info on the very talented, Alexis Winslow- “she is a knitwear and textile designer living in Brooklyn New York. Her knitwear designs have a bold graphic aesthetic and often utilize interesting construction techniques. Alexis is the creative force behind KnitDarling.com and author of the book Graphic Knits (Interweave Press). Her designs have also been published in print magazines including Interweave Knits and Knitscene as well as on the web through Brooklyn Tweed Yarn Company and KnitPicks.com. She has also contributed many designs to books and anthologies including Ann Budd’s Scarf Style 2 and Lisa Shroyer’s Free Spirit Shawls. Alexis splits her time working as a textile print designer by day, the Creative Director/ Cofounder of CharitySub.org by night, and running things around KnitDarling.com in every moment between. Her hobbies include painting, sewing, and embroidery. In addition to numerous gallery shows, her artwork has also been featured on the television show Broad City (Comedy Central) and commissioned by Van’s Shoes for their company archives. Alexis is originally from Norman, Oklahoma. She attended the University of Oklahoma and received her BFA in 2005, focusing on painting and pottery. After moving to New York City in 2007, she studied textile design at the Fashion Institute of Technology (FIT). Alexis now works as a printed textile and product designer, creating children’s bedding and bath products for a large firm in New York City. 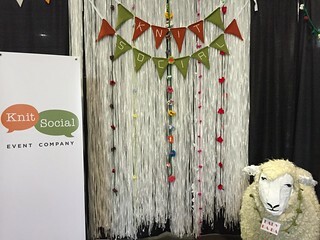 She established KnitDarling.com in 2010, and cofounded CharitySub.org in 2011. Alexis began self-publishing her independant knitting patterns in 2009, and by 2012 landed her first full length book deal for Graphic Knits (Interweave Press). 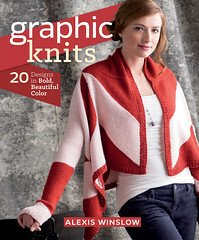 “Graphic Knits is a must-have for the fashion-forward modern knitter. 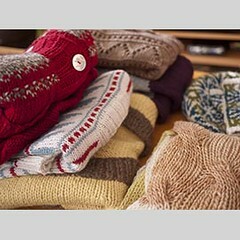 Enjoy knitting 20 bold and colorful designs! Graphic Knits is a collection of 20 patterns featuring modern colorwork inspired by geometric motifs. Fresh and bold, the projects are created by an up-and-coming design star for the Knitscene set. 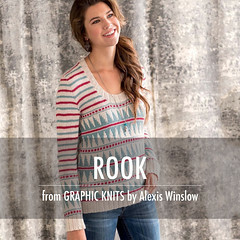 Author Alexis Winslow makes use of color-knitting techniques such as stripes, Fair Isle, intarsia, and slipped stitches to create visually appealing garments. Shape and pattern engage in a playful and mutually flattering relationship across the 20 projects in this book. Many patterns have unexpected, modern details. An oversized, chunky cable scarf is given vivid personality through color blocking. A shapely sweater sports a pretty pattern around the collar—but instead of a traditional Scandinavian motif, bright polka dots create something fresh and new. Now can’t you see why we are thrilled to host this event and why you don’t want to miss it?!! So clear your calendar for next Sunday, Oct. 26th from 2-4pm and come join us at our Point Grey store to try on and gush over all of the designs, meet Alexis and have your book signed, enjoy some refreshments and mingle with friends. Help us kick off Alexis’s westcoast tour with a bang!! FYI-We have the books already in stock (PG store only….sorry NV folks) if you can’t wait until the 26th….or if you are anything like me and just can’t resist:)!! As you’ve probably heard by now, we’re celebrating our tenth anniversary this year, and we’d love for you to celebrate with us. Some of you have been with us from the beginning, and some of you are newer additions to our family. 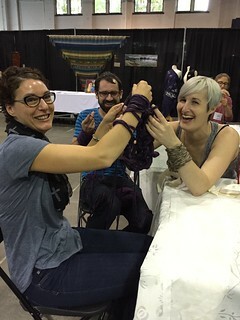 One thing that we all have in common (other than an insatiable love for all things yarn), is that we have some great stories about our experiences at Urban Yarns. To that end, we are collecting stories (urban… ‘yarns’, if you will) from friends, neighbours, customers, staff… pretty much anyone who will share them! Not only are we collecting these stories, but we want to share them with everyone. Select stories may appear in our upcoming 10th anniversary book (shh, it’s still a bit of a secret), our monthly newsletter, this blog, and on our website. We are so proud of all of you, and so thankful that you’ve been part of our community! Spread the word, tell us your favourite story, help us celebrate, and enter to win a prize! 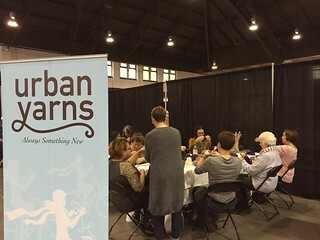 Tell us your best Urban Yarns story! Did someone go above and beyond helping you? Did we find that unfindable skein of yarn? Did you learn something invaluable from one of our teachers? Tell us about it! 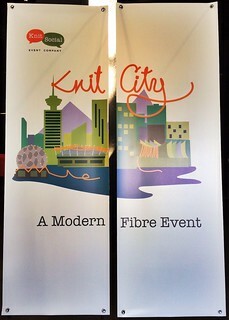 There are prizes to be won for the top stories (as chosen by a select team of Urban Yarn aficionados). * By entering, you are giving permission for your story to be published in the upcoming Urban Yarns 10th anniversary book, and online for promotional purposes. Please include your full name and contact information so we can contact the winners once chosen. If you would like your submission to be published anonymously, under your given name, under a pseudonym, only with your initials, or with some other identifier, please include your preference in the submission email.